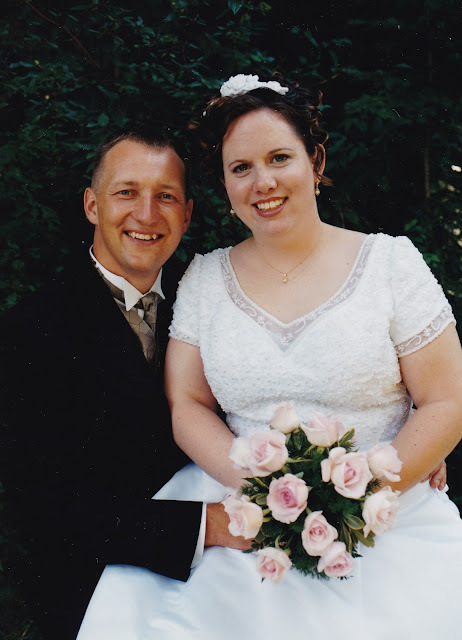 Today is also our 15th Wedding Anniversary. I will have some wedding photos at the bottom of the post. We were married before digital photography completely took over so I scanned in some of my wedding photos last night. For WIP Wednesay today I am showing the blocks for all the Sampler Quilts I have in the works. They are long Works in Progress. Each week I try to sew some blocks for at least one of these quilts and I will be sewing some more today. These are the blocks for my 2012 Fat Quarter Shop Designer Mystery Block of the Month Quilt. Whew! That's quite a quilt title! I have two more to go on this one and then I can start the finishing kit. The push has been on to finish this quilt this year because I need the scraps for another sampler I am sewing as you will see in the next photo. This is the Fat Quarter Shop's "Snapshots" quilt. The patterns for this quilt are a charity fundraiser for St. Jude's Children's hospital. You can find all the information on the Fat Quarter Shop's blog under Quilt Alongs. These are the blocks I have sewn so far from Lori Holt's "Farm Girl Vintage" book. I won my copy of the book from Riley Blake Fabrics in a giveaway on Instagram. (You can buy the book at the Fat Quarter Shop.) Lori is running a sew along called #FarmGirlFridays on Instagram and she posts every Friday on her blog about the two blocks we are sewing that week. I am way behind on this one but having fun. I plan to sew the 6" size of the animal blocks and put them inside the 12" barn blocks and make a barn quilt in addition to the sampler quilt. These are the two blocks I have sewn so far for Sherri Falls "Winter Wonderland" quilt along. The book is only available at the Fat Quarter Shop (as far as I know). Sherri is running a quilt along on Instagram called #verySherriChristmas. I am sewing two quilts at a time. One of them is out of a mix of Christmas fabrics and scraps (on the left) and one is out of French General's "Fa la la la la" line. Sherri was my partner in the "Strawberry Swap" last summer and she made me a fantastic package. I am so thrilled for her that her new book is out. These are the blocks I have sewn so for for my "City Sampler" quilt. 95 more to go on this one. :) The book is by Tula Pink and I am using all Tula Pink fabrics for the quilt. These are my restarted blocks for my Farmer's Wife Sampler Quilt. I am sewing the whole quilt out of "Strawberry Fields" by Fig Tree. I will also be joining in the quilt along for the new "1930's Farmer's Wife" book on the Gnome Angel blog. Click the button in my button bar for more information on that quilt along starting at the end of September. As promised here are some wedding photos of my husband Dave and I on our wedding day 15 years ago. 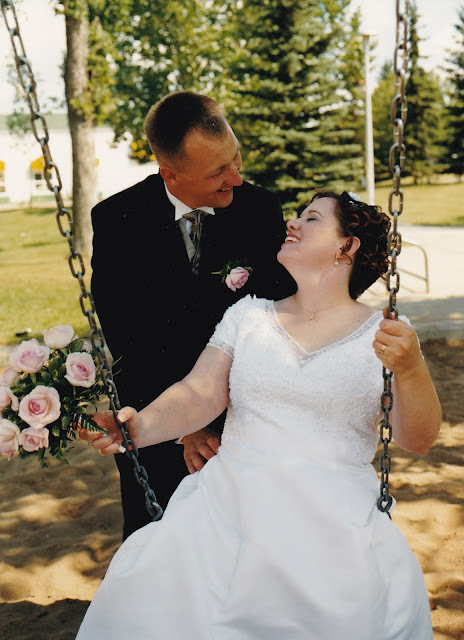 Anita and Dave, August 5, 2000. Thank you so much for visiting my blog today to see my long WIP projects. (I guess marriage is a WIP too!) You can't rush a sampler quilt (or a good marriage). :) I am linking up with WIP Wednesday at Freshly Pieced. Click the button in my button bar to see more wonderful WIPs.